Personalize the learning process with the hands-on Interactive Notebooks Word Study resource book. Interactive notebooks allow students to create their own language arts reference that they can use throughout the year. 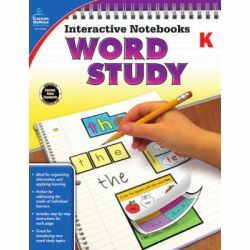 Interactive Notebooks: Word Study makes it easy for you to reinforce effective note taking by encouraging students to create personalized pages for each word study topic. Students will learn organization, color-coding, summarizing, and other useful skills while creating portfolios of their individual learning. This comprehensive language arts workbook guides you through setting up, creating, and maintaining interactive notebooks throughout the year.